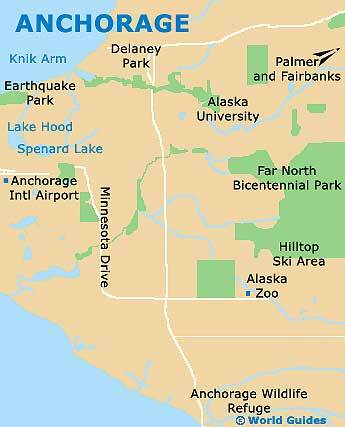 Anchorage is somewhat remote from the rest of the mainland US. Most people therefore tend to arrive by air at the Ted Stevens International Airport and then often choose to rent a car, either from the airport or from rental outlets based in downtown. There is a local rail service from Anchorage to Fairbanks and Seward, although it does not connect with the rest of the States. Cruise ships also depart from the city at timely intervals. 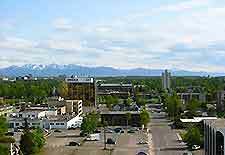 The Ted Stevens Anchorage International Airport is located just 5 miles / 8 km from the downtown district and resides on the West International Airport Road, next to Lake Hood. The airport serves a selection of domestic United States carriers such as American, Continental, Alaska, Delta, United and Northwest, as well as a number of international airlines. Direct flights from the Asia / Pacific region and from Europe are possible, as well as from major northern United States and Canadian hubs. Transfers to and from the airport are easily organized, with most hotels operating a free shuttle service. 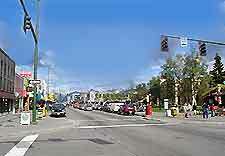 There are plenty of taxis awaiting each flight outside the baggage claim area, while those renting cars can easily reach downtown Anchorage by following the International Airport Road and turning left into Minnesota Avenue. All major North American car rental companies, such as Dollar, Hertz, Avis and Budget, are represented in Anchorage, with most having counters both at the Ted Stevens Anchorage International Airport and the harbor at Seward. The freedom of having your own car while visiting the city lets you explore the hinterland regions and beyond at your convenience, although care should be taken in the winter months, with RVs being the vehicle of choice. While there is no rail link connecting Alaska with the other mainland US states, you can travel to some other main Alaskan towns from Anchorage via rail, from mid-May to September. The Alaska Railroad operates daily services between Anchorage and Fairbanks via the Denali National Park and Preserve, and also south to and from Seward. There are a number of less frequent passenger trains running north as far as Talkeetna throughout the year. 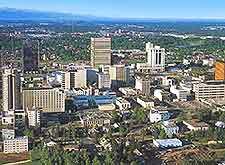 Getting around Anchorage by taxi is safe, comfortable and convenient with five companies competing for your fare. Taxis can easily be found at dozens of taxi stands around the town, or can be hailed from the curb. Other than flying, the only alternative way to reach Anchorage in a timely manner is by boat or ferry. The Gulf of Alaska is plied by several cruise ship lines, as well as the Alaska Marine Highway ferry system. Although time consuming, traveling by sea does offer a pleasant and relaxing way to experience the spectacular Alaskan wilderness.